This tragedy is recognized as the most extensive natural disaster in Brazilian history. 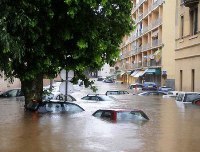 In mid-January at the State of Rio de Janeiro struck the heavy rains. During the day, had the monthly rainfall. Out of the river banks and mudslides wiped samostroy urban satellites Rio. The number of dead closer to a thousand people, tens of thousands were left without krova.No had some wonderful stories of salvation. Twenty-five Wellington Guimaraes with his wife and half-year-old son arrived in Nova Friburgo to visit the wife's mother and the family decided to spend the night at her from behind begins to rain. All slept in one room. A man woke up from a strong noise roared and tried to sit on the bed. At this point, the house covered the mudflow, and the time for him to stop. Rousing himself, Wellington realized that immobilized, both legs were crushed by the earth. Nearby he found the body of his wife, she was dead, and then heard the voice of syna.Snaruzhi approached some people were shouting that we should be careful with the wall, and then suffered a second collapse, krikm upstairs stopped. Guimaraes freed his feet, sweeping around the wreckage. "I keep praying and digging, focusing on the baby's crying. How long it took time for it, I do not know completely lost all sense of time," said Guimaraes, but finally he took Nicholas in his arms. The boy was crying. "Then I thought that he wants to drink and, putting his mouth, began to drink it with his saliva. Surprisingly, he knew what to do to get moisture. Kid encircled my face in his hands and reached for my mouth. When firefighters opened the gap and gave the water, I'm the same way, mouth to mouth, watered his fill, and only then realized that we are saved. "Rescue teams dug out a father and son after 16 hours. Six boys pulled out a shirt and calmly ". In Nicholas was only a small scratch on his face. After he was taken to hospital, he ate and slept well, "said Wellington, who does not know how to live. Don Ilair, 56 years old, too, everything starts from scratch. She survived, thanks to its neighbors. Neighbor-Gilberto also convinced that God saved her. "Of course God, but with your help," agrees a woman. This video spread all over the world. The situation was critical. The house where hid Ilair, collapsed under the onslaught of water. "If it were not for this string, we would not have saved her. But two days ago it was not yet", said second participant rescue Gabriel. "But we have begun repairs, and to raise the roof of the cargo, we are stocked with a thick rope." "They threw a rope and threw me, I can not remember how I managed to tie the knot, I actually do not know how to tie them. One of my dogs did not depart from me, I picked her up," says Ilair. "Throw a dog, pull the legs, screaming neighbor. I followed, but the dog does not throw smogla.V some point, she suddenly bit me greatly, and I could not hold her, not saved. My hand slipped, and I thought, this is the end, but taller and intercepted resist, just praying: "Lord, grant me the strength to get to the house. I still have my business here, I need to bring to mind two children. "nbsp; Ilair shows the wounds on his hands from the rope and from a dog bite. Two young boys managed the seemingly impossible, they raised the roof Ilair more capital at home. "I thought that if God saved me down there, then save and are taller. We were evacuated by boat after another neighbor, he gave us a rope ladder on which we went into it. If it were not for neighbors, I was dead, we" said Don Ilair. "In general, I am afraid of heights. I do not know how I get to the roof of the saving. In another town, Terezopolise family Magno de Andrade was going through their tragedy. Favela Morro de Español landfall caught up when it got dark. Seven rescued a grandmother, she first heard a suspicious noise and ordered everyone to flee. Fifteen years Pedro has fallen, crushed rubble. The foot was tightly grasped a fallen wall. All were shoveled dirt and debris, trying to free the boy, but in vain. After repeated unsuccessful attempts teenager pleaded and asked to leave it and go for help. "I told him that he will not give up and pulled out, even though I'll have to pull his leg," said Magno. "If the father is gone, then I die. The pain of what I had lost a leg, less terrified, and I said, bring. My father did it, and I do not regret anything. No one knew what might happen the next moment, new landslide could bury us all, "said Pedro. Magno pulled so that the leg bone cracked, she succumbed, and the guy pulled out. The father knew that his son wants to make a football career, but he had no choice there. Fractured tibia and a knee injury negated the dreams of Pedro, but he believes he was lucky, because the number of killed a family of 12 people.